10 tracks - playing time: 34:12 min. An intro including movie samples from ‘ die hard with a vengeance’ ; a perfect start if you ask me. And if those samples are driven by a stonerriff I’m directly getting curious about what this band is going to bring. 9 tracks later I’m twisted. Zeuss brings catchy stoner/grunge rock with some doom influences (listen carefully), and does it pretty good on songs like ‘ Drive On’ and ‘ Save Me’ (best song on the record). In this last song they come pretty close to what kyuss was doing. However, the music sometimes sound to predictable and Jeroens Vocals are sometimes too much fragile. That’s why this record listens like they have to made some democratic decisions or made a full length to quick. 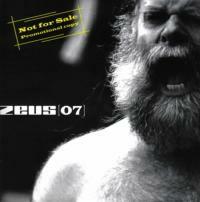 Zeuss can write promising songs in this genre, but it goes nowhere really wild, there are no real surprises. And that’s a shame, I hope Zeuss improves and dare to search for the boundaries of this genre.